We’re in the digital age, and technology is everywhere. It’s also showing no signs of slowing: New technology is continuously developed, old technology is enhanced, and employees need tech skills more than ever before. If you want to be a competitive job applicant, it’s a good idea to develop your tech skills now. But with so many types of technology, what skills should you focus on? And won’t the technology you need to learn depend on the career you pursue? What if you don’t know what you want to do yet? Don’t worry. In this article, we’ll discuss three of the most widely used workplace technologies. No matter what career you decide to pursue, learning Python, Java, and CRM software should come in handy in the future. One of today’s most in-demand skills across a wide range of industries is coding, basically the ability to write programming language that a computer can understand. Coding is used to develop websites, software, and apps. Most tech-related careers will require some knowledge of coding. 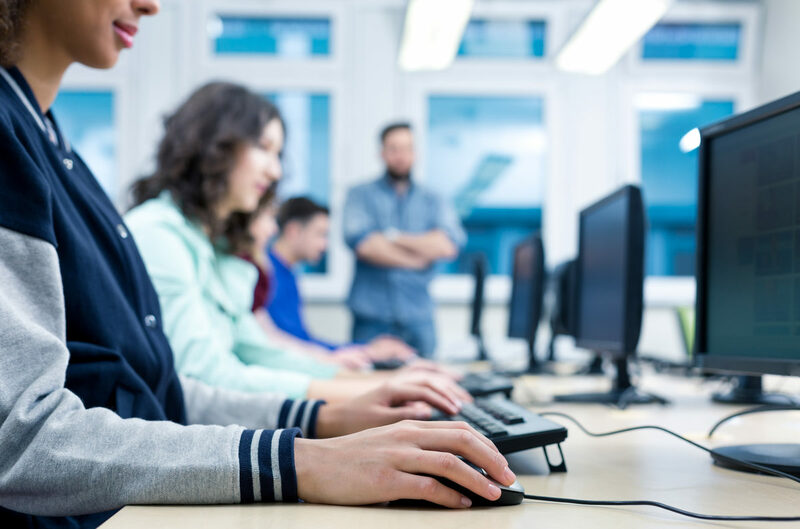 Skilled coders can land lucrative careers as software application developers, web developers, database administrators, computer network architects, computer systems analysts, network systems administrators, and more. Knowledge of coding can also help you get ahead in career areas like data analysis (important for business and financial analysts), engineering, science, and even arts and design. If you’re interested in one of these careers — or if you aren’t sure what career field you’ll go into — developing at least a basic knowledge of coding is a smart move. There are several programming languages, but arguably the most well-known is Python. It’s a great coding language for beginners, since it’s versatile and uses relatively simple syntax. Over the last 25 years, Python has been the fastest-growing programming language. It’s expected to continue dominating in the future, whereas other coding languages may eventually go extinct. One reason Python is likely to flourish is that it’s a foundational piece of major up-and-coming technologies, including machine learning, virtual reality, and artificial intelligence. That means job security for Python developers, who have a good chance of being in high-demand well into the future. Plus, some of the world’s top companies use and recommend Python. That includes Netflix, NASA, Facebook, Instagram, Google, and Dropbox. If you’re interested in learning Python, there are plenty of tutorials, courses, and books available on the topic. One of the most popular resources is Codecademy, where you can access free Python tutorials. Google also offers a free Python class. Helpful books include Python Programming for the Absolute Beginner and Python Crash Course: A Hands-On, Project-Based Introduction to Programming. Since Python is one of the most widely-used and easy-to-learn programming languages out there, resources are plentiful. Browse the Internet for courses and books that fit your budget and meet your needs and get started! Another popular programming language is Java. It’s most often used for creating mobile apps and developing the backend of websites, but it’s not limited to these uses. Like Python, Java is relatively simple to learn. Its syntax is similar to English, so it’s great for beginners. It’s also popular, so a large community of developers use Java. This means that you’ll find plenty of advice, support, and resources as you begin to study the programming language. Java is highly scalable, making it a good choice for large websites. It has been used by 90% of Fortune 500 companies to develop websites and desktop apps. Java has also been used for most Android apps, since the Android Operating System runs on a Java language environment. Although this is slowly changing, Java developers will be needed into the future to maintain and update existing apps, in addition to creating new ones. According to Indeed.com, Java programmers are in high demand relative to other programmers. The average salary for a Java developer is $73,285, with top developers earning over $100,000 annually. Although the future looks brighter for Python, Java continues to be one of the most in-demand programming languages today. As with Python, Codecademy is a great place to start for learning Java. You can find tutorials on Udemy or Coursera too, with levels ranging from beginner to expert. A popular book that teaches Java is Learn Java in One Day and Learn It Well. There’s also a Beginning Programming with Java for Dummies book. Again, search around for resources that fit your budget and needs. As you start to learn Java, you can even join coding communities like Stack Overflow to ask questions, share ideas, and get advice from experienced programmers. CRM, or customer relationship management, involves managing an organization’s relationships and interactions with customers. Today, most companies use a CRM system, a tool that helps business keep customer contact information updated, manage customer accounts, and track customer interactions. It stores information about purchases, service requests, customer preferences, and more. The complete history of each customer’s relationship with the business is stored in one place. This allows companies to personalize interactions with individual customers, resulting in successful sales and customer loyalty. Using customer data, companies can make decisions that improve the customer experience and increase productivity and profits. There are many types of CRM systems and software. Some of the most popular are Salesforce, Zoho, Odoo, and HubSpot. If you learn the basics of at least one system, you should be able to quickly pick up on others. As businesses continue to become more customer-centric and personalized, CRM software is becoming more popular. It enables businesses to keep track of customers, deepen their relationships, and encourage customers to come back and spend more money. Since customers are the ones who make a business profitable, these abilities are essential. CRM is the fastest-growing enterprise software (software for businesses), and research company Gartner predicts that by 2021, it will be the single largest revenue area of spending in enterprise software. To put that simply: Tons of businesses are investing in CRM software, so it’s a useful tech skill for you to learn. If you’re interested in marketing or business/sales analysis, CRM will be an essential skill. It’s used by sales representatives, marketing managers, sales managers, and even copywriters, videographers, or other creatives who help develop targeted advertising campaigns. And some of these careers can be very lucrative. Marketing managers, for instance, earn a median salary of $129,380, according to the Bureau of Labor Statistics. Even if you don’t want to go into marketing or sales, any technology that’s used by most businesses is worth learning. If you ever want to start your own business, knowledge of CRM software can help you build a solid base of satisfied, loyal customers. You can take online CRM courses through sites like Udemy and LinkedIn. Tutorials are available on YouTube, and many popular CRM software companies offer beginner’s guides to CRM and/or useful videos. There are also countless books on learning CRM software, but they are usually geared to a specific type of software. For instance, you can find books on learning Zoho, books on learning Salesforce, and so on. Since Salesforce is currently the most popular CRM software, we recommend starting with that one. If you end up working for a company that uses a different CRM software, knowing the basics will allow you to learn their system quickly and easily. If you already have a future career in mind, there may be other tech skills you should learn too. But if you’re undecided, Python, Java, and CRM software are useful in a wide range of careers. All three of these skills are fairly easy to learn and can lead to lucrative and rewarding opportunities. Start with the tech skill that seems most interesting to you. Watch a tutorial, sign up for a free course, or read a useful guide to get started.